CommandInvokationFailure: Failed to align APK package. Someone could help me with this problem? I`m making an android game with unity and i finished it but i can`t build it. 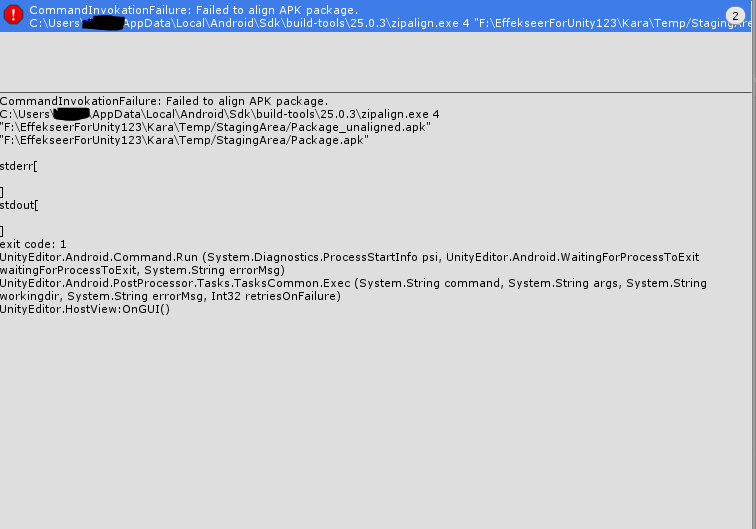 It appear this: CommandInvokationFailure: Failed to align APK package. I Moved a file from build tools to tools in sdk, I didn`t forget to add keystore file to developer settings. I tried to see similar answers but no one helped me. The question hasn`t been asked several time before and there aren`t existing answers available that can be found through a search. C:\Users\Stefano Tonola\AppData\Local\Android\Sdk\build-tools\25.0.3\zipalign.exe 4 "D:\Programmi x86\Unity\FlappyDiBonito2\Temp/StagingArea/Package_unaligned.apk" "D:\Programmi x86\Unity\FlappyDiBonito2\Temp/StagingArea/Package.apk"
4) select android sdk tools 25.0.5 and 25.0.3 i.e update it or install , also go to sdk platform tab and install updated android SDK platform which you are using or you can download the latest like nugget latest if you want one . I have read that you need to use KItKat as the SDK platform as it works best with cardboard. I'm not sure if this will solve the problem but it might be one of the errors.